I had a neighborhood friend, Claire. We were never true best friends, but we had our moments. Favorite fact about Claire: her mother always dressed her in red when she was attending pizza parties, to minimize the impact of food stains. 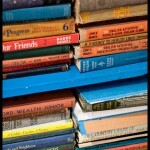 Somehow, in the early elementary grades, we discovered that we had both just finished reading the same book. 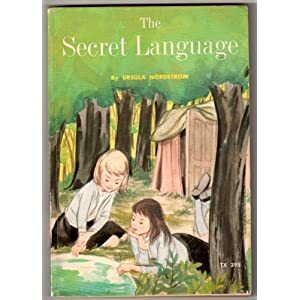 And we loved it equally: Ursula Nordstrom’s The Secret Language. Neither of us had heard of boarding school before (but as readers, we were about to learn plenty about that irresistible-for-authors setting where there are no parents to watch the comings and goings of young protagonists). We were fascinated. More than anything, Claire and I were both wholly won over by the friendship that developed in that book between the painfully homesick Victoria and the wildly bossy Martha. And we were in total awe of the secret language they shared. We tried to invent our own, and we sort of did. But our experience was more in keeping with real-world kids; we’d forget which words meant what. Martha would never forget that leebossa meant wonderful. We just couldn’t compare. And this is a sad fact of my youth: I remember thinking that the real-world friends I had couldn’t compare with the friendships I read about in books. Friends in books clicked with each other in a way I did not click with anyone else throughout elementary school. Never fear, reader: I found those friends later. Still, I feel a little sad for that young me. But I also feel so grateful that she was a reader. And that there were secrets and friends and adventures to keep her entertained, engaged, and happy. This entry was posted in Uncategorized and tagged best friends, characters, childhood friendships, Martha Sherman, The Secret Language, Ursula Nordstrom, Victoria Northa. Bookmark the permalink. I found many friends in books too, when I was a child. I think that’s one of the reasons why I write MG books! I remember having that same feeling about friends–only for me it was more in middle school than grade school. Maybe that is why it is so easy to make powerful friendships with other writers–we all understand these sorts of bonds so well. I am always amazed (and pleased) to find that at writing conferences, retreats, etc, there is so much sharing and friendship and so little posturing and status-building. Very different from my experience in my other profession, and so much more reaffirming. I am so grateful for my literary friendships!